Our range of Sauter force measuring devices and test stands are easy to use, give high speed of operation and are tough enough to withstand harsh environmental conditions in all applications. 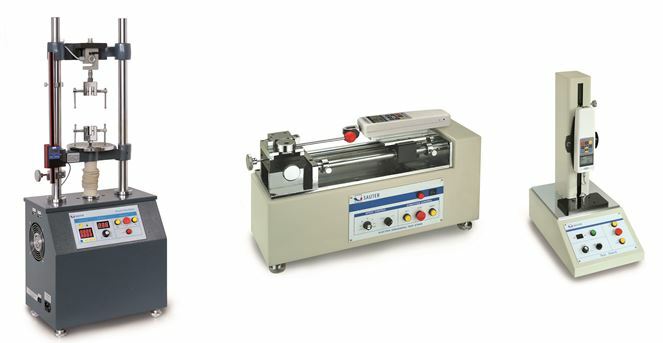 All units have peak hold functions,zero and selectable weighing units of Lb, Kg and N for use from 2 N to 5000 N.
The Sauter test stand TPE has been developed specifically for peel testing. Typically this involves pulling a bonded material layer from a base material, it is safe and reliable to sue and as general rule the significant value in this process is the force required to pull away the top layer from the bonded material. It is designed such that the force measuring unit exerting the force simultaneously moves side wards and upwards. This means that a peel-off movement is produced, avoiding shear forces which could distort the result and moves at an angle of 45° to the horizontal and the force-measurement device is fitted in an exact vertical position suitable for upto 500 N.